WhatsApp Business app for Android launched. Facebook-owned WhatsApp today launched WhatsApp Business - a free-to-download Android app for small businesses. The new app will make it easier for companies to connect with customers, and more convenient for users to chat with businesses that matter to them. WhatsApp Business is an Android app which is free to download, and was built with the small business owner in mind. With the app, businesses can interact with customers easily by using tools to automate, sort, and quickly respond to messages. And people will continue to have full control over the messages they receive, with the ability to block any number, including businesses, as well as report spam. WhatsApp Business enables you to have a business presence on WhatsApp, communicate more efficiently with your customers, and help you grow your business. If you have separate business and personal phone numbers, you can have both WhatsApp Business and WhatsApp Messenger installed on the same phone, and register them with different numbers. You can use WhatsApp Business with a landline (or fixed) phone number and your customers can message you on that number. During verification, select the "Call me" option to receive the code over a phone call. You can use both WhatsApp Business and WhatsApp Messenger on the same phone, but each app must have its own unique phone number. Messaging Tools: Save time with smart messaging tools - quick replies that provide fast answers to frequently asked questions, greeting messages that introduce customers to your business, and away messages that let them know you're busy. Account Type: People will know that they're talking to a business because you will be listed as a Business Account. Over time, some businesses will have Confirmed Accounts once it's been confirmed that the account phone number matches the business phone number. 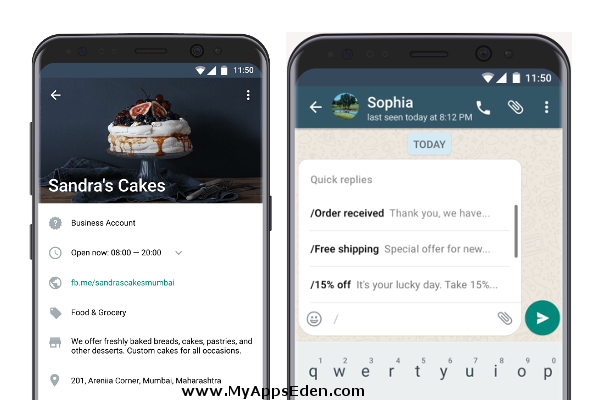 WhatsApp Business is available today and free to download on Google Play in Indonesia, Italy, Mexico, the U.K. and the U.S. The app is rolling out around the world in the coming weeks.